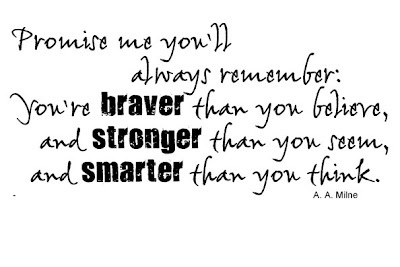 This is such a sweet little quote from the Winnie-the-Pooh collection! I liked it so much, I actually made 3 versions and put them into one zip file for you. The first version is the one you see right here, the second version is a plain version of the first one. The third version is a longer version of the same quote, with more context to it. I love this! I want to do a layout of my 2-year-old grandson with this. Thank you SO much!!! What a great piece of word art... and I love the message...TYFS with us. I'm just loving your word art and especially the Poohisms. Please keep them coming. lol @ Aussie Jay - Poohisms! Love it! OH MY! You are doing such a wonderful job with these quotes....love this one! I love this...I came over from Helen H's blog and truly glad I did!! Beautiful, thank you.